Among the many themed restaurants of Japan, there’s one that remains a firm favorite with locals. 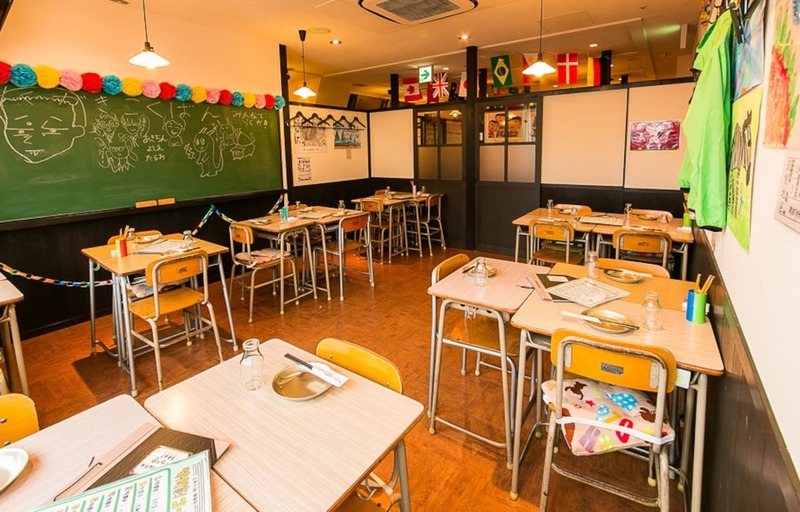 Called “Rokunen Yonkumi,“ or “Sixth-Year, Fourth Class,” the izakaya pub-style restaurant is built around the theme of a Japanese elementary school, with diners stepping into the shoes of a sixth-year elementary school students. Complete with classrooms, school lunch-type meals, and a VIP room set up in the “principal’s office,” a night here takes customers on a fun trip back down memory lane. And for those of us who didn’t spend our early years at a Japanese school, the place is filled with eye-opening experiences! The trip back to school starts at the door, where visitors take off their shoes and place them inside a school-style shoe rack by the door. Then it’s time to walk by the school lockers on the way to the classroom. While some people choose to dress up in school uniforms for the visit, anyone can cosplay as a twelve-year-old student using the randoseru school backpacks and yellow caps available to visitors. Diners are then taken down the hall to their designated classroom. Some of the rooms available include a teacher’s office, nurse’s station, and science labs. The menu is printed inside notebooks and student registers, with meals that include elementary school staples like chilled milk and “soft noodles” with meat sauce. And because this is school, you can’t leave without having to do a test. Diners who score full points will receive snacks as prizes. With branches in Osaka, Fukuoka, Kyoto and Shibuya and Shinjuku in Tokyo, there are a number of different school “locations” to try out, so be sure to visit their website (in Japanese). Whether you’re a local or a short-time visitor, it’s the most unique way to experience school life in Japan!